Concord pack the biggest cultural offering north of Boston. 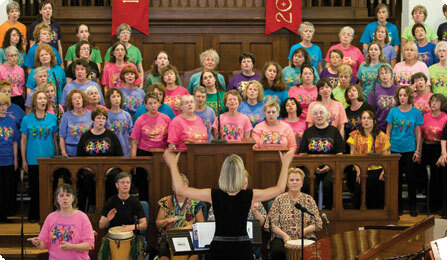 Concord Community Music School has attracted top talent to teach and perform here for more than 30 years – it hosts more than 150 concerts each year and both the Mandolin and Fiddle festivals draw international audiences. The Capitol Center for the Arts is New Hampshire's largest theater and offers top name music acts, Broadway shows, international performing artists, ballet – you name it. And, just across Main Street, Red River Theatres shows independent films and offers events like costume parties and sing-alongs unavailable in big box theatres. Down the street, the Concord City Auditorium has all kinds of concerts, shows and plays in a smaller setting, many of them free. And Downtown is gearing up for the reopening of the city's long shuttered, historic Concord Theatre. To get an idea of this venue, think upscale, flexible performance hall for concerts, small theater production and more. Up on the Heights, a former retail space at the Steeplegate Mall is now the new Hatbox Theatre – a 99 seat performance arts space that is offering everything from theatre and magic shows, to NH's first Puppet Slam. 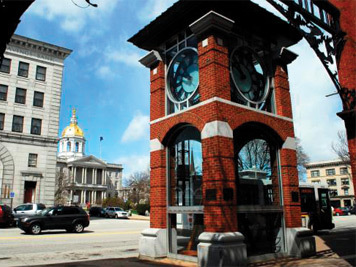 Our thriving arts community includes notable galleries, such as the Kimball Jenkins School of Art at 266 North Main Street and the League of NH Craftsmen Concord Fine Craft Gallery at 36 North Main where visitors can experience and purchase original art and handcrafted items created by juried craftsmen. Down the road 49 South Main Street is home to the League of NH Craftsmen headquarters and its Permanent Collection Museum where it hosts four themed exhibitions a year in the adjacent Gallery. 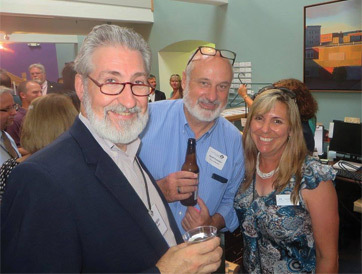 Across the hall, visitors can enjoy rotating exhibits from the New Hampshire Art Association and the New Hampshire Furniture Masters Association in the Capital Region Visitor Center. The award-winning Concord Arts Market takes place weekly in Bicentennial Square throughout the summer and the City of Concord's first annual outdoor sculpture exhibit is happening all year long along Main Street. Concord's West end features the new Crumpacker Gallery at St. Paul's School. It hosts four major shows a year featuring works from both well-known and up-and-coming painters, sculptors, photographers, illustrators and collectors. Concord is home to some of the best jewelers in the state and whether you’re looking for a custom design or a unique gift you’ll find it here. Capitol Craftsman Romance Jewelers features talented artists and craftsman from around the United States through its handcrafted gift line. Gems First is known for its stunning sketches of one-of-a-kind jewelry designs. A graduate of Parsons School of Design owns Goldsmiths Gallery and the shop specializes in designing or selecting jewelry that complements a customer’s wardrobe and lifestyle. Kristin Kennedy Fine Jewelry is a League of New Hampshire Craftsmen juried member that specializes in working in high-end metals, precious gemstones and organic jewelry design. To enhance your shopping, dining and visitor experience, Concord welcomes sidewalk performers and lots of local establishments host various musical acts including jazz, pop, rock, acoustic, Irish acts and more. Alan’s Restaurant - live music from 8:30 p.m. to midnight on Thursday, Friday, and Saturday nights. Area 23 - live music on Wednesday, Friday and Saturday around 8:30 p.m. The Barley House Restaurant & Tavern - live Irish music on Tuesday nights. Common Man Concord - live music featuring local artists every Thursday night from 7-9 p.m.
Concord Craft Brewing Company - Catch Matt "the Sax" in the brewery on alternate Thursdays. El Rodeo Mexican Restaurant - live mariachi band the 3rd Thursday of each month. Granite Restaurant & Bar (at The Centennial Hotel) - live Jazz every Thursday from September to June. Hermanos Cocina Mexicana - live jazz (the most of any club north of Boston!) and blues in the lounge from 6:30-9 p.m. Sunday to Thursday, and live folk and rock music from 7:30-10 p.m. on Saturdays. Makris Lobster & Steak House - live bands perform Thursday to Sunday (Fridays are outside on the deck!) from May to Sept., and every Friday night year-round. New England College's Listening Room Music Series features intimate evenings of live music right on Main Street – catch a concert almost every weekend. Strings & Things Music regularly hosts free public music events including clinics that feature live performances along with discussion and Q&A. True Brew Barista - Live music on Friday and Saturday nights featuring local performers. Want to listen to music outdoors? Concord Library offers a "Music on the Lawn" series at 6 p.m. and live performances are offered throughout the summer at historic Eagle Square around 7 p.m., and Bicentennial Square through True Brew Barista. And up on Pleasant Street, Presidential Oaks hosts live outdoor weekly performances from June 26 to August 7 on Tuesday evenings at 6:30 p.m. for the "Summer Concerts on the Green" series featuring patriotic, big band, jazz, swing and more. The city is full of music, art and culture - get out there and enjoy! Visit our Creative Concord webpage to learn more about the many arts organizations driving our local economy and how the Chamber's standing committee to advance the creative economy in our region is involved and supporting that effort.